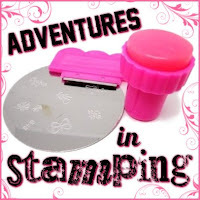 I could not wait to try out my new stamping tools! I knew that my first attempt would probably not turn out that great, but practice makes perfect! I had a hard time deciding which design to use, there are a lot to pick from! I ended up choosing a retro design. For the colors I decided to use two of my Butter London polishes: Fash Pack as the base and Toff for the design. These two colors look amazing together! I was worried that Toff might not show up that well but I wanted to try! I was right...Toff did not show up that well and it's not a very dramatic mani. It is a nice suttle design, but I really wanted to try the two polishes together. Lesson learned!